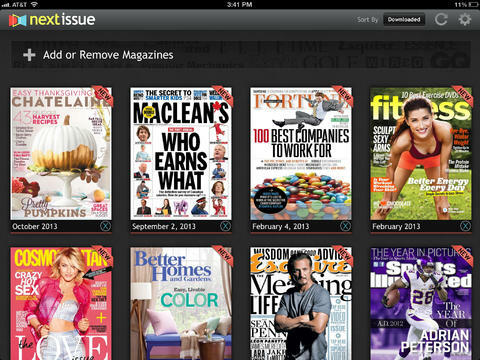 Rogers announced it would launch Next Issue Canada last month, an unlimited magazine service for customers. The service went live a couple days ago and the iPad app hit the App Store yesterday. The service is live for existing wireless and cable customers first, with the rest of Canada getting access on December 15. $14.99/month: customers will be able to access all weekly and monthly publications. All You, Allure, Architectural Digest, Backpacker, Better Homes and Gardens, Bloomberg Businessweek, Bloomberg Markets, Bon Appétit, Brides, Canadian Business, Canadian Health and Lifestyle, Car and Driver, Chatelaine, Châtelaine, Coastal Living, Condé Nast Traveler, Consumer Reports, Cooking Light, Cosmopolitan, Cosmopolitan for Latinas, Country Living, Details, Eating Well, Entertainment Weekly, Esquire, Essence, Every Day with Rachael Ray, Family Circle, Family Fun, Fast Company, Field & Stream, Fitness, FLARE, Food Network Magazine, Fortune, GQ, Glamour, Golf Digest, Golf Magazine, Golf World, Good Housekeeping, HGTV Magazine, Harper’s Bazaar, Health, Hello! Canada, House Beautiful, InStyle, Inc., L’actualite, Ladies’ Home Journal, Living the Country Life, LOULOU, Lucky Magazine, Maclean’s, Marie Claire, Men’s Fitness, Men’s Journal, Midwest Living, Money, MoneySense, More, Motor Trend, O, The Oprah Magazine, Parents, PC Magazine, Popular Mechanics, Popular Photography, Popular Science, Real Simple, Redbook, Road & Track, Rolling Stone, Saveur, Self, Seventeen, Shape, ShopSmart, Siempre Mujer, Ski, Southern Living, Sports Illustrated, Sportsnet, Successful Farming, Sunset, Teen Vogue, The New Yorker, This Old House, Time, Today’s Parent, Town & Country, Traditional Home, Us Weekly, Vanity Fair, Vegetarian Times, Veranda, Vogue, W Magazine, Wired, Woman’s Day, Wood, Yoga Journal plus more. 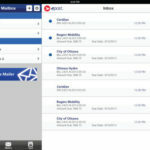 Existing users can visit nextissue.ca and sign in with their existing My Rogers username and password to try the service. You can click here to download the Next Issue iPad app. Let us know what you think of this service.